We have a mailing list of people looking for this doll. 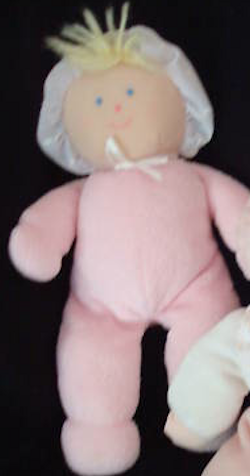 I’m looking for a 10 inch 90’s Eden doll wearing a pink terry sleeper. She has ball shaped hands and feet. There’s a white satin bow at her neck and she has a pink and white gingham cotton bonnet with wide white eyelet trim ruffle brim. The hair is yellow and I believe made of a yarn or yarn looking material. I had a doll like this that was given to me by my parents. She was my security. I had her everywhere I went and couldn’t sleep without her. When I lost my first doll, luckily they had a backup. She had a bad accident with my dog and was by my side when I was hospitalized twice. I found it comforting to sleep with her on my face. Sadly, she was put out of commission by the age of 21. I am 24 now, and I am curious to find a doll like this one. If anyone knows where I can find this doll it would be greatly appreciated. I have this doll for sale on Ebay. Item #290960159539. This is the doll I am looking for. Is it still available and if so, for how much? Mine isn’t, I gave up on here, no one on the mailing list ever had the decency to reply and I sold mine in October. The one Judy listed in her post is still on Ebay for $59.99 but there is another one cheaper; item #151209646567. You just have to go to advanced search on Ebay and enter in the item number, click search and it will bring up the listing. And yes, this particular doll does sell for that much and more. I’m sorry to hear that no one on the mailing list contacted you, Dianna. But I do agree that this doll is expensive when it shows up. Of course that discourages many Searchers. I have a couple of these that I will be washing and listing on Bonanza within the next couple of days or so. i am looking for this doll (in good condition) too. please let me know if you have one currently available. thanks! I am also still looking for this doll. Unfortunately, for all those looking for this doll, this is one of those lovies that you will not get cheap, you need to be prepared to pay big $$$ because the continued demand keeps it value up. I sold mine for $55 after I offered it here and no one replied. Make sure you are signed up to receive e-mail notifications on your post. I am looking for this same doll for my daughter who is 23 years old for Christmas – she still has this doll but has no face and only 1 arm. If anyone has this doll I would like to purchase it. FYI, i finally found one in excellent condition on ebay. it was the second one i had seen there, but the first was more worn than i wanted. i would encourage others to keep checking the site, and i hope you have as much success as i did.